Have you ever wondered how your friends breeze through Cleanse Days while you continue to struggle? Or maybe you’re preparing to complete your first Cleanse Day but are feeling a bit overwhelmed. And even if Cleanse Days aren’t a problem for you, you may be wondering how you can better help others make the day a little easier. A decrease in extra calories, such as from added sugars, while on an Isagenix® System may be hard to adjust to overnight. It’s best to gradually start cutting back ahead of time. For example, if you’re someone who only has tea or coffee with sugar, maybe try adding less and less until you can enjoy it without. The same goes with sugary snacks. If your body is expecting loads of sugar every few hours, it’s going to be in for quite the shock when you cut this all out at once. Gradually cutting back on excess calories ahead of time will make it easier to complete both successful Shake Days and Cleanse Days in the future. A minimum of two Shake Days should be completed before completing a Cleanse Day. This is important to help your body adjust to smaller meals, whilst delivering nutrient-dense food to nourish your body with what it needs to optimise its own detoxification processes. If starting an Isagenix System is a big change from your usual habits, you may need to complete additional Shake Days to ensure that you have a successful experience. The body adapts over time to anything you do, so if your body is accustomed to a much higher level of calories, it may be necessary to gradually reduce calories until you can complete Shake Days with ease. Once you have mastered Shake Days, you will be much more prepared to complete a successful Cleanse Day. To avoid an unpleasant and, at times even an unsafe experience, don’t be afraid to rely on a little support from an experienced coach and support tools. Isagenix offers several tools to make intermittent fasting attainable and sustainable. While everyone should follow the system guidelines for completing a Cleanse Day as closely as possible, you also have the flexibility to make adjustments as needed. This is important to keep in mind for both yourself and when coaching others because everyone’s needs and experiences on a Cleanse Day will differ. One of the simplest but possibly most effective tips, is to organise your schedule in advance and to set reminders throughout the day to help you to stick to your schedule. 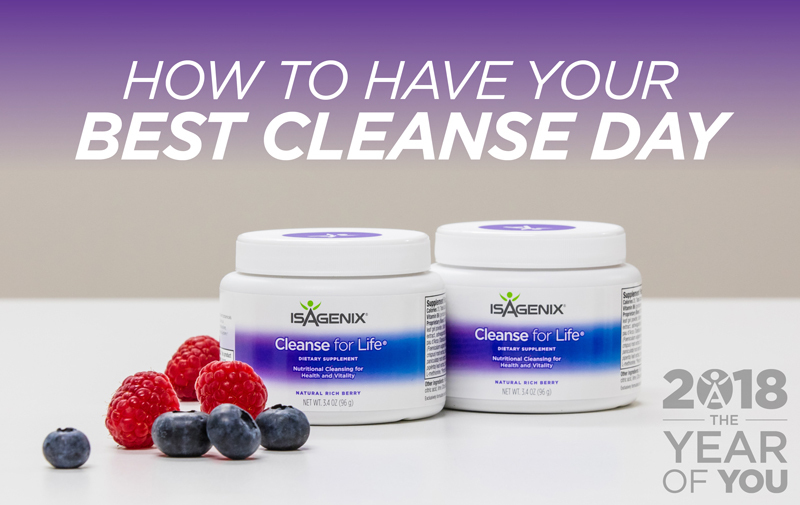 Remembering to have each serving of Cleanse for Life™, stay hydrated and eat Isagenix Snacks™ (and other Cleanse-Day support foods) throughout your Cleanse Day can sometimes be hard to do, especially when new to the process. Going too long without consuming anything at all may lead to an unsuccessful Cleanse Day experience. By consistently giving your body a little nourishment every hour or two, you are less likely to experience excessive hunger or dips in energy levels, which will help to make your day more enjoyable. Ever notice that when you have a slow day you tend to snack a lot more? While everyone is different, many people find that the easiest days to complete Cleanse Days are on days when they’re busy. Consider planning your Cleanse Day on a day when you have several errands to run, or on a day full of appointments and meetings. A day spent at home with easy access to the fridge and pantry can be way too tempting, even for the most resolute cleanser! Another strategy for choosing which days to cleanse might be to plan around your workout schedule. Every fitness routine should include regular rest days, which can be a great time to schedule a Cleanse Day. Like any new habit you are trying to form, it takes time to adjust before a new habit becomes second nature. If you’re not able to complete an entire Cleanse Day as you planned, don’t beat yourself up about it. Break your Cleanse Day guiltlessly with an IsaLean™ Shake and try again next week. It’s best to complete at least five Shake Days before planning your next Cleanse Day. Most of us are accustomed to an eating pattern of constant grazing, so adjusting to one that involves fasting days can take some time to get used to. Cleansing, like any skill, becomes easier as you go. Everyone can benefit from some extra preparation that leads to a more pleasant Cleanse Day experience. Even seasoned cleansers can try adding some of these tips to their prep routines for their best Cleanse Day yet! Get the Taste of Australia! ANZ.IsaFYI.com is your hub for the latest Isagenix news. Discover solutions for transforming your health and wealth and get recognised along the pathway to achieving your dreams. Bookmark us and subscribe to the RSS feed—we’re your connection to all things Isagenix. The site is provided solely for your personal noncommercial use. You may not use the site or the materials available on the site in a manner that constitutes an infringement of our rights or that has not been authorized by Isagenix. You may not modify, copy, reproduce, republish, upload, post, transmit, translate, sell, create derivative works, exploit, or distribute in any manner or medium (including by email or other electronic means) any material from the site.